Our group had a wonderful day visiting Caesarea Maritima, Mount Carmel, Megiddo, and Nazareth Village. I captured some nice photos, but am just too tired from the jet lag to work on them for posting. Maybe tomorrow. Everyone in the group seems to be well and enjoying the experience. Tonight we are at Tiberias on the Sea of Galilee. Our group arrived safely in Israel at the Ben Gurion Airport near Tel Aviv about 5:10 p.m. (7 hours ahead of EDT). After claiming all but 2 pieces of luggage for the entire group, we had time to go to Joppa for a short visit before sundown. Later we drove north along the Plain of Sharon to Netanya where we are staying at a hotel overlooking the Mediterranean Sea. This provides a beautiful view of the sea, and the moon is full. I look forward to seeing the waves by day light. Tomorrow we plan to visit Caesarea Maritima, Mount Carmel, Mediggo, and the Nazareth Village before arriving at Tiberias on the Sea of Galilee. Jane and Olen have been with me on several tours, and many of you have come to enjoy Jane’s blog. She reports on lots of interesting stuff that goes on behind the scene. I encourage you to follow her Journeys With Jane as we make this journey through Israel and Jordan. The URL is http://journeyswithjane.blogspot.com. Shortly we will be departing Atlanta for Israel. Ready to photograph scenes of the Bible World. Thanks for following the blog. Hopefully you will find it interesting and helpful. After a few days in Israel we will cross the Jordan River into Jordan to visit important sites there. Then we will cross back into Israel for the conclusion of our tour. The photo in the camera LCD screen is of the Jordan River at the traditional Bethany Beyond the Jordan from the Jordan side of the River. Surely I will receive a few links from friends who want to inform me that certain discoveries have been made that should be mentioned on this page. Because I am busy getting ready to leave the country I do not have time to write in detail. Please take a look at the links I suggest for reliable information. Bible Places Blog by Todd Bolen. Ben Witherington. Be sure to see the Bill Cosby clip, too. Giant Skeleton Found. Michael Hasel discusses the report of the discovery of skeleton’s of giants in the recent issue of DigSight here. There is also good info on the Khirbet Qeiyafa excavation and ostracon. The Samaritans celebrate passover today, April 28, 2010. 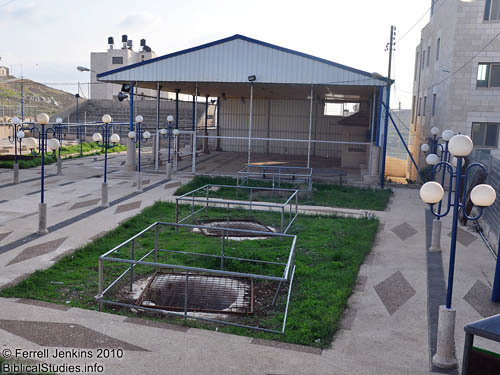 Lambs will be sacrificed and roasted in the pits seen here on Mount Gerizim. Pits used by Samaritans on Mt. Gerizim at Passover. Photo by Ferrell Jenkins. See old photos at Life in the Holy Land here. Todd Bolen has some nice photos and explanations at Bible Places here, and another article here. A website provided by the Samaritans is available here. Passover is a celebration that originated as the Israelites prepared to depart from Egypt. The Samaritans are a curiosity in the modern world. The men and boys wear a dress-like robe, while many of the women dress in modern fashions. We have written more about the Samaritans here. Samaritan man and woman on Mount Gerizim. Photo by Ferrell Jenkins. Jesus paused in the valley below Mount Gerizim at Jacob’s well. He discussed the issue of worship in “this mountain” with the woman of Samaria (John 4:1-42). Jordanian students from the International Academy Amman spent a week excavating at Umm Qais. The full article may be read in The Jordan Times here. Students from the International Academy in Amman work at Um Qais. Photo by Taylor Luck, Jordan Times. 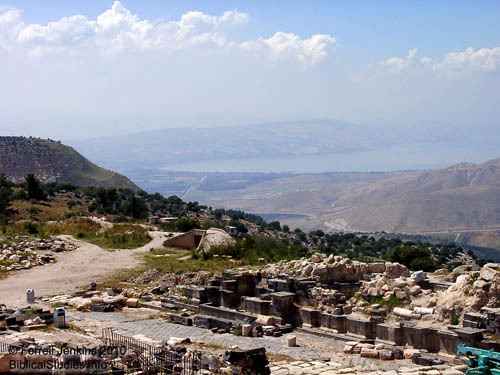 Gadara, the most magnificent of the Hellenistic towns that circled the Sea of Galilee, was located on the heights of Gilead above the Yarmuk River. The marine suburb and the city’s harbor were located on the southeastern shore of the lake, at Tel Samra (now Ha-on Holiday Village). In form, Gadara’s harbor resembles that of Sussita—a closed basin with an opening to the south—but it is much larger and more luxurious. The central breakwater is 800 feet long and its base 15 feet wide. The promenade was 650 feet long, built with finely chiseled stones, only one of which remains. The 150-foot-wide basin covered an area of 3 acres. This harbor is superior to the one at Sussita not only because of its size but also because of its facilities. At the center of the promenade are the remains of a tower. Ruins of a large structure—probably the building of the harbor administration—are scattered on the ground near the harbor gate. The photo below was made in the late afternoon when citizens of the local Jordanian village came out to enjoy the view. The view across the Sea is not clear, but you can see the entire western coast line. In the right foreground you can see a bunker used by the Jordanians in recent wars in the region. The hill directly across from the bunker is the beginning of the Golan Heights. Prior to 1967 this was in Syria. The Yarmuk River flows into the Jordan River south of the Sea of Galilee. All of the significant rivers of Jordan that flow into the Jordan River have dams on them, thus decreasing the amount of water flowing into the Jordan. Late afternoon view of the Sea of Galilee from Umm Qais. Photo by Ferrell Jenkins. The next photo was made in 2002. It shows a portion of the nymphaeum (attractive water fountain) and the Yarmuk Valley. 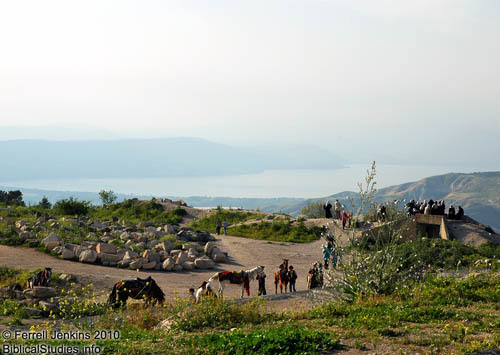 The Sea of Galilee from Umm Qais (Gadara). Photo by Ferrell Jenkins. Todd Bolen posted a beautiful, clear photo that also shows the Yarmuk River valley and the nymphaeum here. Note that the nymphaeum had undergone some reconstruction when his photo was made. The Egyptian Supreme Council of Antiquities announced Thursday the discovery of a hoard of 383 bronze coins dating to the time of King Ptolemy III (ruled 246–222 B.C.). The well-preserved coins, found in the Fayoum about 50 miles southwest of Cairo, depict the Egyptian god Amun-Zeus on one side and the words Ptolemy and king in Greek on the other. 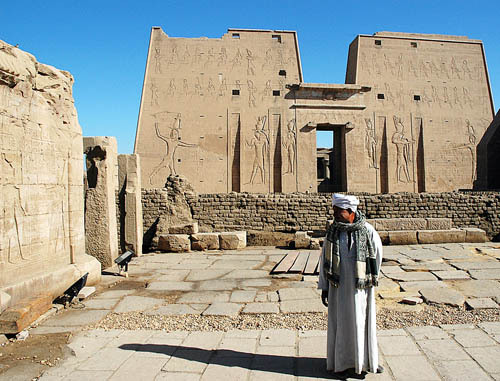 The Edfu Temple begun by Ptolemy III. Photo by Ferrell Jenkins. Philip the evangelist began at that Scripture and preached Jesus to him. HT: Joseph I. Lauer; various media reports. Update: Todd Bolen has posted a beautiful photo here of Lake Qarun near the site of the discovery.